Powerless is undergoing a shift in power. Deadline reports the series’ creator, Ben Queen, has left the upcoming NBC series. 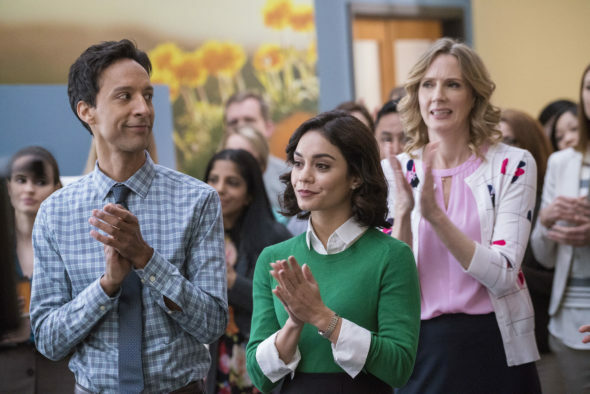 The comedy stars Vanessa Hudgens as a “a spunky young insurance adjuster specializing in regular-people coverage against damage caused by the crime-fighting superheroes.” The cast also includes Danny Pudi, Alan Tudyk, and Christina Kirk. Queen is apparently leaving due to creative differences. Because of the abrupt exit, production on Powerless has been delayed until a new showrunner is found. However, the comedy will still premiere in early 2017 as planned. What do you think? Are you interested in Powerless? Will you still watch the comedy without the original creator?